The summer of 2012 proved poor for many of my cacti and succulent plants. Flowering was sparse and sometimes delayed from normal seasons. 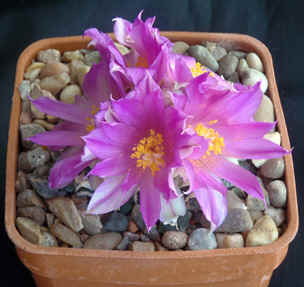 Gymnocalycium bore few flowers; my mesembs were particularly poor, the Gibbaeums looked out of sorts and Lithops flowers were in short supply and four to six weeks late. Then in mid October normality returned in the form of my Ariocarpus plants. Despite the odd season, the buds appeared and the flowers were out ‘on time’. First were A. retusus and A. furfuraceus with pinkish-white blooms, but I did not think to get my camera out. 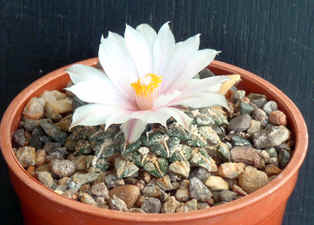 Then three of my small A. kotschubeyanus plants and my old A. agavoides flowered on the same day. So I offer you images of the three A. kotschoubeyanus with different petal colours and my favourite Ariocarpus species, A. agavoides (front cover) owing to its intense flower colour. These plants are easy to grow given gravelly, alkaline compost and plenty of water during the summer and early autumn. Mine live on a high shelf so they get lots of sun. 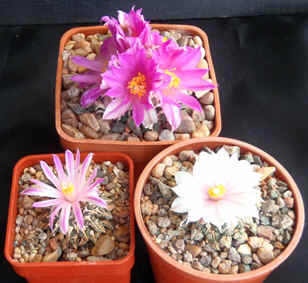 Ed: I am not sure that I would rate Ariocarpus easy to grow but never mind, thanks for the article and pictures!